The Angry Bureaucrat: Why the Hell Do We Vote on a Tuesday? Why in God's name do we vote on a Tuesday? It's so very stupid - practically every other modern democracy votes on the weekend, usually the ENTIRE weekend, to give everyone who wants to vote plenty of time and opportunity to do so. But not in the greatest democracy in the world - no no, we expect people to somehow find time in the middle of the work week to go to polls that are often only open from 8AM to 6PM (or even shorter). Of course, this makes it hardest for hourly employees to go vote, as many salaried employees often have the leniency to come in a little late or go home a little early to vote - just one more subtle way in which the U.S. makes it more difficult for poorer people to vote than for richer people to vote. 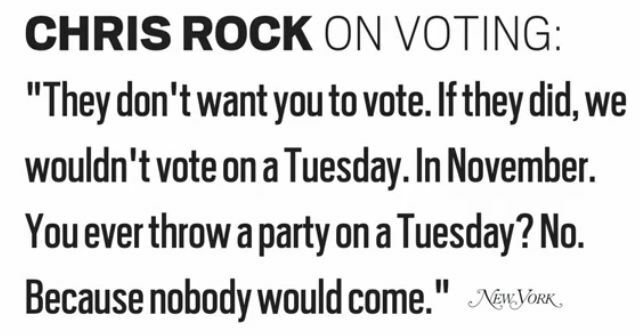 But why do we have this stupid "vote on a Tuesday" system? The answer, as explained thoroughly in the below video, is that Congress passed a law in 1845 - yes, 15 years prior to the onset of the Civil War - setting an official voting day. The logic at the time was that Congress didn't want people to have to travel on Sundays to vote and didn't want people to miss Wednesday market days, etc. etc. Eventually, Congress settled on Tuesday as the best day to accommodate the travel times required to get places in horse-drawn buggies so people could vote with the minimum disruption to their lives. So, why do we vote on a Tuesday? Because Congress has never bothered to revisit the wisdom of a slavery-era law that set the optimal voting day according to the time needed to travel via horse-and-buggy. Such a stupid practice that could be fixed by Congress so easily - but no. And we wonder why America is in decline. Labels: Bad Ideas, History, Justice, Politics, U.S. The stupid practice could also be at least partially remedied by making Election Day a federal holiday, but apparently no one can be bothered to make that happen, either. We get stupid holidays like Columbus Day but not Election Day? Whatevs. Gayle: Excellent point. I'm always a big fan of the Facebook posts on Columbus Day that are along the lines of, "This year, go celebrate Columbus Day by marching into someone else's home and declaring that you live there now." It does seem a bit ... outdated, to say the least, to celebrate someone who many consider to have started one of the greatest genocides in world history. But celebrating democracy by having Election Day off? Now that I can get behind.